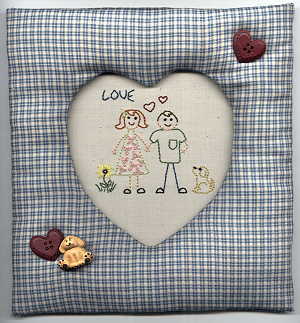 Stitch this sweetheart couple hand embroidery design and make a heart shaped frame to go with it. 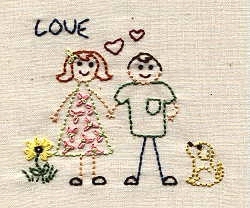 This pattern uses the following embroidery stitches: Backstitch, Lazy Daisy, French Knot, and Satin Stitch. If you don't know how to do any of these stitches Click Here for an instruction page. Use double thickness of muslin and other light fabrics. Secure fabric in a wood embroidery hoop. Stitch using three strands of floss. Three different stitches are used in this design: Backstitch, Lazy Daisy, French Knot, and Satin Stitch. 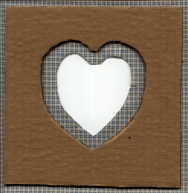 When finished, prepare the picture to fit in the frame by centering the picture over a piece of thin cardboard 5" x 5 1/2". Fold the edges over the cardboard tightly, one at a time, and glue in place. Cut 2 pieces of cardboard according to the frame pattern, 7" x 7 1/8"
For the front, extend all the edges of the pattern 1 1/4" and cut. For the back, extend all the edges of the pattern 1/2" and cut. Lay the smaller piece of fabric out, wrong side up. Center the back piece of cardboard onto the fabric square. Fold the 1/2" fabric allowance over the cardboard edge of one side and glue. Do the same to the opposite edge and be sure to pull the fabric a little to make it tight. 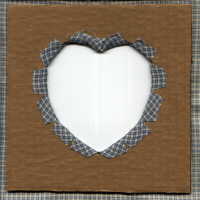 For the top and bottom edges, turn in the corners as shown and glue, then fold over and glue. Lay the larger piece of fabric out, wrong side up. Center the front piece of cardboard onto the fabric square. 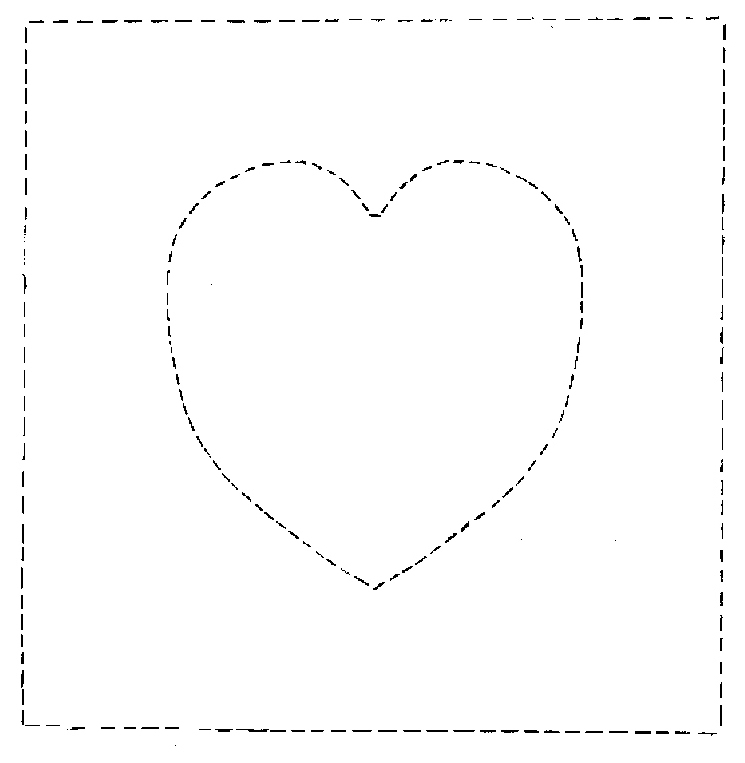 Inside the cut-out heart shape, draw a line 1/2" from the edge and cut along the line. Turn the front piece over. Starting with the bottom of the frame, put a small amount of polyester filling between the fabric and the cardboard. Fold the fabric edge over the cardboard tightly and glue. Do the top the same way. Before doing the sides, fold in the corners as you did previously for the back, glue. Now finish each side by evenly distributing filling and folding the fabric over the cardboard, hold tight and glue. Take frame back and turn it wrong side up. Run a generous line of glue around the two sides and bottom of the frame back. Add Accessories to the frame. Use the frame for any picture.